After 7 years of trying to get back, the Pittsburgh Penguins have finally returned to the Stanley Cup Finals. After 25 years in existence, along with some very talented teams that weren't able to get over the hump, the San Jose Sharks will play in the Stanley Cup Finals for the first time. The story lines are nearly endless as the teams prepare to kick off the series. On the Pens' side, Sidney Crosby became the youngest captain in NHL history to lift the Stanley Cup, as Sid the Kid was 21 years old when Pittsburgh knocked off the Red Wings in 7 games. Evgeni Malkin won the Conn Smythe Trophy at 22 years old, and the prevailing opinion at the time was that it would be the first of many championships for the young core, but Crosby and Malkin are now in their late 20s still looking for that elusive second Cup. As for San Jose, Joe Thornton and Patrick Marleau are longtime Sharks who have been around for the disappointing early exits from the postseason. 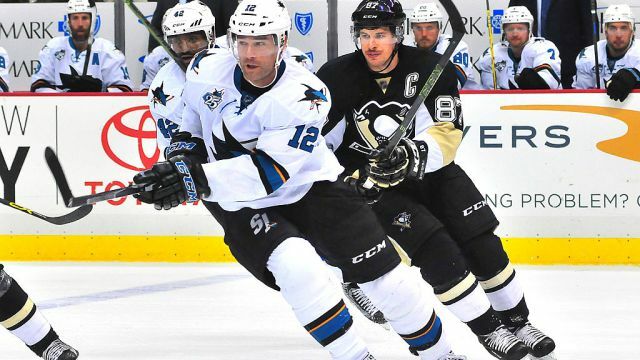 Marleau is the former captain of the Sharks, who was stripped of his "C" to find it end up on Thornton, who likewise would go on to lose it in favor of current captain Joe Pavelski. The two have taken more than their fair share for San Jose's shortcomings, but they're both big parts of the reason why the Sharks are here today. Thornton continues to be one of the best players in the game, leading San Jose and finishing 4th in the entire league with 82 points (19g, 63a). He's continued it in the postseason as well, with 18 points (3g, 15a) in as many games. And while Marleau has started to lose a step, he's still a very effective player and one of the Sharks' better scorers, finishing 4th during the regular season with 48 points (25g, 23a) and currently sits 5th in the playoffs with 12 points (4g, 8a). While the old guard has been a big part of the playoff push, it's the new wave of Sharks who have been driving the Cup run. Logan Couture leads the team and the league with 24 points (8g, 16a) while Pavelski is the top goal scorer with 13 along with 9 assists. Defenseman Brent Burns also tops a point per game in the playoffs with 6 goals and 14 assists in 18 games played. These are the type of contributions that the Sharks weren't getting years ago as they were derided as chokers, and combined with Thornton and Marleau they present a formidable offensive punch. That offensive punch has led to San Jose to scoring at a 3.50 goals per game clip over the course of the postseason, best in the league, while they've allowed just 2.28 goals per game in the postseason as well, third behind only the Washington Capitals and the Anaheim Ducks, two teams that stopped playing long ago. Martin Jones has backstopped the team this far, posting a 0.919 SV% and 2.12 GAA, numbers largely in line with the 0.918 SV% and 2.27 GAA he recorded during the regular season. They're numbers not far off the league average, and the offensive punch and possession ability of the Sharks have done a more than adequate job of shielding him through their playoff run. - Patric Hornqvist and Carl Hagelin have been named to Team Sweden for the upcoming World Cup of Hockey. Inexplicably, Phil Kessel was left off Team USA despite being one of their best international performers and a Conn Smythe Trophy favorite, and Kris Letang couldn't make the cut on a deep Team Canada blueline. - Nick Bonino has missed practice after hurting himself blocking a shot in the 3rd period of Game 7 against the Lightning. He returned later in the period to finish out the game, and he's expected in the lineup for Game 1 against the Sharks. - A number of players have previously won the Stanley Cup in this series, more so on the Penguins side, but Chris Kunitz is the only 2-time Cup Champion taking part in this series.